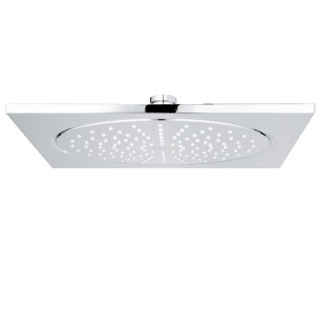 Grohe Rainshower F Series Head Shower 27271 offers a shower head diameter of 10 Inches (10''). Grohe Rainshower F-Series Head Shower is part of the Grohe Rainshower F Series showering range at PlumbNation. Grohe Rainshower F-Series Shower heads are also part of the unique Grohe Rainshower collection. The Grohe Rainshower F-Series Head Showering range is designed with a super flat panel shower head which will blend in seamlessly into the shower surroundings, and also creates more showering space.